Today’s rally was an incredible success. 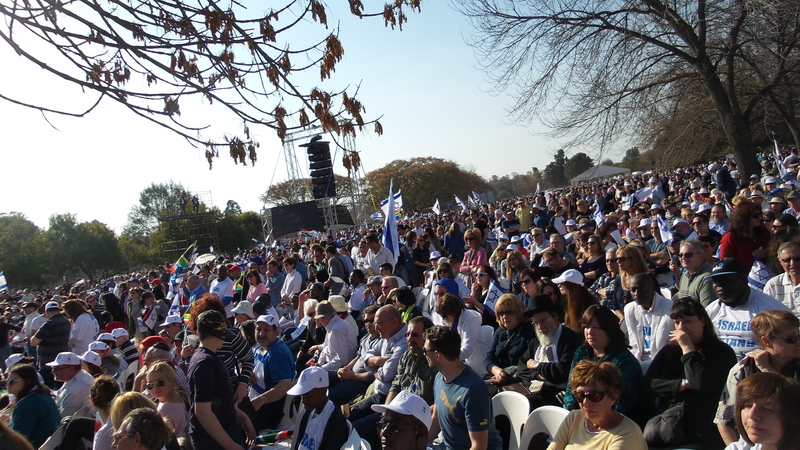 Security officials reported over 12,000 people of different faiths and races, amidst tight security from the South African Police and community security organizations. Despite a few hundred pro-Palestinian demonstrators outside, and a Palestinians citizen who was arrested with multiple guns and knives in his possession at one of the entry- points, excellent security and of course, God’s help allowed this rally to proceed with no incidents of violence, as has been seen in so many other countries. representative of numerous political parties and leading Jewish and Christian Representatives were present, and one of the highlights was definetly the grand entry of the Bishop of the 6 million strong Shembe Church, to the sound of Vuvuzela’s and Zulu instruments, certainly a first on the planet! The eloquent rising star of South-African politics, Olga Meshoe, showd off her charm and incredible speaking skills, and of course, the legendary Chief Rabbi of South Africa, Rabbi Dr Warren Goldstein delivered a powerful and dignified address.